>Looking for Gifts for a Hunter? >As we head towards the Holidays, we’re going to try to come up with some great, quick ideas for you for gifts. Here’s our first one. This pattern is a free download pattern from http://www.polarknit.com/. It calls for 3 skeins of PolarKnit ($8.50 per skein). And, while you’re at it, how about a pair of “pop-up paws”? These are basically fingerless gloves with a section that pulls over the top of the fingers to form a mitten. These are great for hunters (and others) who need their fingers free occasionally, but want their fingers warm for the rest of the time. This is a Nancy Lindberg Pattern called “Fits Like … a Glove” and uses a DK weight yarn. The pattern is available in the store for $4.50. 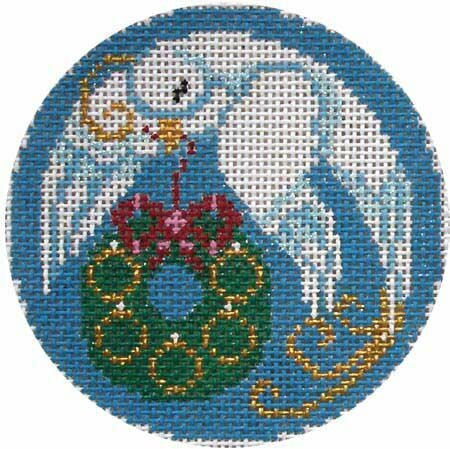 The needlepoint department is in the planning stages for a monthly class that will begin in January to complete the 12 Days of Christmas ornaments from Shelly Tribbey. We have EXCLUSIVE stitch guides for this class, so it should be a fun and informative group of lessons. If you are interested in the class, please call us to get your name on our list. In the meantime, if you would like to pre-order your canvases during the Shelly Tribbey trunk show, you will receive 20% off your canvas purchase. The trunk show is only in the store through November 25, so make sure to let us know before then if you would like to pre-order them. The Shelly Tribbey needlepoint canvas trunk show arrived in the store today. In addition to lots of canvases, there are some fun finished pieces to help you envision what you want to do. Come in and check it out! Don’t forget, all trunk show canvases are 15% off retail price — and if you’re a 3K Club member you get an additional 5% off!